What is meant by learner persistence? And, why is it critically important that students have persistence as they matriculate through different learning experiences? All too often we see students that, at the onset of difficult or deep thinking, give up on the task or learning opportunity. So how then can we, as teachers, drive persistence in our students and promote grappling with complex academic concepts while steering them away from just giving up on the learning moment when the outcome is not easily revealed? A launching point for this work is to realign students’ thinking toward process learning versus an outcome-based result. In this process, teachers communicate to students that struggling with learning or thinking tasks helps the individual student to learn and grow from the struggle. Sharyn Livy, Tracey Muir and Peter Sullivan (2018) explain that, ‘… providing challenging tasks, teachers should communicate frequently that struggle is important, stimulates brain growth and helps develop a growth mindset’ (p.18). However, this unique frame of thinking or perspective takes time to develop in the mind of a young student. And learners need this gift of time to develop the skills for persistence. Teachers involved with this change in thinking must also allow students to manage the struggle through failure by not stepping in too early or too often. When teachers frequently and prematurely correct students they strip the intellectual ‘heavy lifting’ away from them and the real learning moment is then lost. As such, teachers who involve themselves with too much frequency easily stifle the curiosity and ingenuity which can eliminate the challenging nature of the task (Roche & Clarke, 2014). Rather, strategic questioning (asking the right questions at the right moment) are facilitated by the teacher only when the student is not proceeding with their productive struggle. The teacher steps in when the effort, thinking, or risk-taking has observably stopped with the student. Productive struggle leads to effective classrooms in which complicated problems and tasks are apparent, risk-taking is welcomed and participants are comfortable with failing; yet are intrigued with conquering complicated tasks (Livy, Muir & Sullivan, 2018). These persistence abilities match those which will be confronted in their lives and when students enter the workforce – especially in careers that are STEM-based or where other critical thought and problem-solving skills are required. Students who are familiar with productive struggle recognise its benefits. One student comments, ‘We do learn more when we’re confused and we’ve got to work our way out of it’ (Roche & Clarke, 2014, p.7). This is the attitude and demeanor of a student who understands that real learning is happening when tough, complicated learning tasks are presented that require complex thought and connections to be made. The teacher also has a considerable connection with developing this attitude for learning. He or she must encourage students to persist through uncomfortable and difficult learning moments. When students believe they can power through and succeed with rigorous learning, when they believe they can productively struggle and increase their learning on a complex topic, persistence has been achieved. But the student needs to engage in the action that will allow for productive struggle. ‘When solving tasks, students are encouraged to persist, believe they can succeed … In order to foster this behaviour, students need to engage in challenging tasks and lessons that allow for sustained thinking, decision making, and some risk taking by the students’ (Livy, Muir & Sullivan, 2018, p.20). As classroom teachers, what are some of the strategies that we can implement in our classrooms to effectively engage students in a persistence toward productive struggle? Teachers use instructional strategies that encourage persistence and struggle as part of the typical daily classroom routine. These include: questioning, encouraging, time allowance, and acknowledging. Figure 1 defines the instructional strategies of productive struggle. Figure 1: Adapted from Warshauer (2015). Using the instructional strategies from the table above, teachers can develop student persistence and productive struggle that allows learners to transfer their reflective practices from one task to the next, instead of being isolated to one specific area of instruction. This promotes student self-efficacy, an improved sense of metacognition, and a greater depth of critical thinking skills. Engaging students in persistence and productive struggle is a necessary component of today’s classrooms. However, teachers who implement productive struggle instructional strategies know that allowing their students to ‘do the work’ will foster student thinking, risk-taking, and persistence. Students who learn through productive struggle believe in their ability to attempt and complete tasks they may not know how to solve. To encourage students to press forward through complex tasks, teachers can use strategies such as: questioning, encouraging, time allowance, and acknowledging. 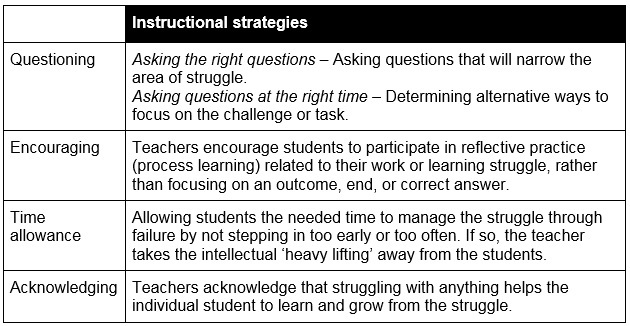 Although there are many paths to build productive struggle in students, these specific instructional strategies can be a launching point for initiating a classroom of learners who are willing to persist through all learning experiences. Livy, S., Muir, T., & Sullivan, P. (2018). Challenging tasks lead to productive struggle! Australian Primary Mathematics Classroom, 23(1), 19-24. Roche, A., & Clarke, D. (2014). Teachers holding back from telling: A key to student persistence on challenging tasks. Australian Primary Mathematics Classroom, 19(4), 3-7. Warshauer, H. K., (2015). Strategies to support productive struggle. Mathematics Teaching in the Middle School, 20(7), 390-393. One of the four instructional strategies outlined in Figure 1 is ‘time allowance’. Think about your own teaching. Are you allowing students adequate time and space to work their way out of or through a challenging task, or stepping in too early or too often? If you’re stepping in too early or too often, what’s behind your decision to do so?